As we work to make our village even more useful to you and future members, we welcome your ideas and suggestions to make BMAV a bigger, stronger community for aging in our homes. We look forward to hearing from you. Email us at BMAVillage@gmail.com. BMAV offers full members the option of getting help from volunteers. Members who have taken advantage of this are discovering that these service calls can be rewarding both for the recipient and the volunteer service provider. "It’s great to see more members reaching out for assistance, and I enjoy working with our wonderful volunteers to fill the requests,” Executive Director Elizabeth Haile said recently. One BMAV member who got some help with a cranky toilet flapper was “delighted,” adding that “guests were just on the brink of arriving” when BMAV came to the rescue. Elizabeth said that in recent weeks, service call volunteers also have replaced ceiling light bulbs, adjusted storm windows for summer duty and replaced a screen door handle. In fact, Elizabeth said the village could use some more volunteers to help with light household repairs. The volunteer who was able to help said that feeling of satisfaction touched the giver as well as the receiver: “It feels good to do small chores around the house, but it felt really special to give a hand to someone else.” There are other benefits, as in this quote from another volunteer: "Volunteering is fun! It is easy, it introduces you to folks you don't know, and it makes you feel like you actually live in a neighborhood." Other services BMAV currently offers includes providing rides to appointments or BMAV events and making friendly visits or calls. We plan to offer more services in the future. If you have a service request we can help with or if you would like to volunteer, just contact us weekdays at 240-630-2628 or by email at BMAVillage@gmail.com. A group of BMAV members recently canvassed several areas within BMAV boundaries that are underrepresented in our membership. On May 21, the group knocked on about a hundred doors to spread the word and leave brochures to encourage more neighbors to join our village. Members who canvassed included Marren Meehan, Nancy English, Marylou Carnevale, Bob Metzler, Linda Whitney, Lynn Barclay and Bruce Coolidge. Help us get the word out about BMAV to those who don't know about us yet! If you live in in a high-rise or other area within our boundaries that could use some individual outreach, let us know. We can provide you with brochures to distribute or even do a presentation to your neighborhood group. According to a recent Washington Post article, baby boomers, most of whom still work, are joining villages for the activities (think biking, happy hour, cooking classes) and a richer social life with others like them who live in their neighborhoods. Most are not at the stage of needing the services that villages offer to enable seniors to stay in their homes as they age. BMAV has many social members who are taking advantage of our robust calendar of programs. 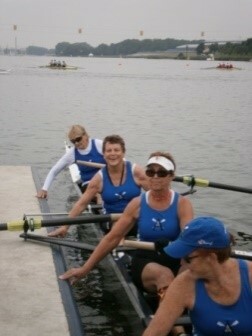 One outdoor activity that boomers and older women have taken to, says the Post, is rowing. 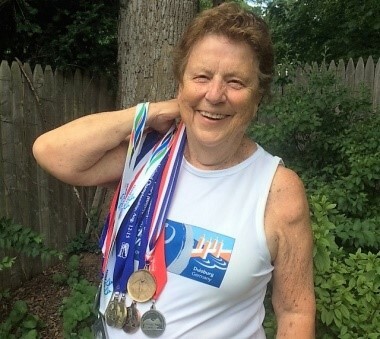 It’s a good way to get and stay fit and make new friends, as BMAV member Hanne Caraher has found (see interview below). Hanne Caraher, who has lived in Bethesda since 1971, has had an enormously full life, with deep interests in several areas. One of them is wine. Early in her career, Hanne was the managing editor at a wine magazine. At the time, she knew almost nothing about wine. That changed. She learned a lot, which led to her decades-long interest in and appreciation of wines, several trips to Germany, the Tyrol and Alsace to visit wineries (she’s visited every major winery in Germany), her position as an officer in the national German Wine Society and its local chapter and finally, decades-long friendships. Another is rowing, which Hanne took up after she retired. She’d long thought rowing looked like fun and told herself she’d do it one day. She did and says, “Rowing is my life now; it keeps me alive, kicking and thinking.” She’s competed nationally and internationally, often quite successfully. In fact, Hanne has quite an array of medals to show for it – gold, silver and bronze. She won a silver medal in her very first regatta. She won the gold medals she is most proud of in the 2011 World Rowing Masters Regatta in Poznan, Poland, and in the 2012 Head of the Charles Regatta in Boston, the premier rowing event in the U.S. Hanne now crews with the Gray Knights rowing team. The third major thread in Hanne’s life is languages. She studied English, Latin and French for years, through high school, then studied English and Spanish at the University of Heidelberg, where she obtained the equivalent of an MA in conference interpretation and translation. She left Germany for the US in 1961, married and had children. Several years later she began a career in magazine publishing, serving as copy editor, managing editor, director of publications and finally, chief editor and translator of German political research and economic policy texts for a company in Rockville. Finally, Hanne has long been interested in the concept of villages. Several years ago she began pushing for creation of a village that would include parts of Bethesda not already covered, including her neighborhood. The idea gained traction and she and a few others were there at the first stages of BMAV’s creation. She now serves as the village’s volunteer coordinator and is on the services committee. 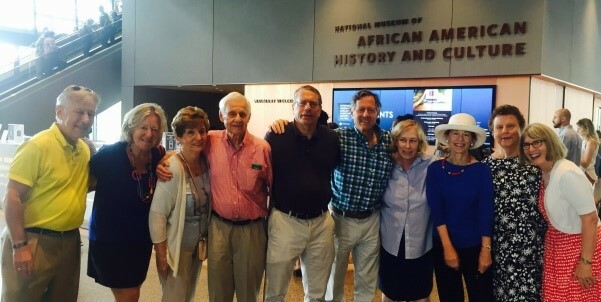 June 14, field trip to the National Museum of African American History and Culture.Twelve BMAV members went and learned so much during their four hours there. 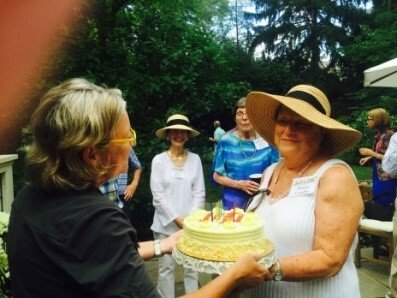 June 23, garden social at the home of Marren and Tom Meehan in their lovely back yard.The event was made more special by a surprise birthday cake for BMAV member Hanne Caraher.Many thanks to the Marrens for hosting. June 25, Margit Meissner, Holocaust survivor, talked about her escape from Europe during the Holocaust (speaker series; see below). June 27, social media class for the non-tweeter, first in a series of small Tech Tutor sessions for BMAV members. Next month, we’ll have a Q&A session with area high school students who’ll be able to help members with their devices.More sessions to follow. If you haven’t already responded to the email poll you received a while back from BMAV, please let the office know what tech topics you’re most interested in. 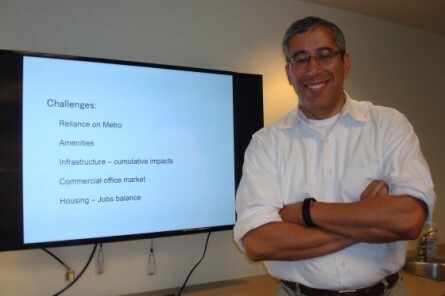 BMAV members may be the best informed Bethesda residents, and even more so for those who heard Ken Hartman’s presentation on May 22 at the Bethesda-Chevy Chase Regional Services Center. Ken showed several images of downtown Bethesda “back in the day” and now, and talked about changes since Metro arrived in 1984. He then discussed the challenges, plans and projections for the future, including development, housing, bike paths and open spaces. He fielded questions from the audience of some 25 people about sidewalks, trash and recycle pickups, bike racks, Metro, the Purple Line and other issues of interest. If you have a Bethesda-related question or problem, you can contact Ken at 240-777-8200 or email him. 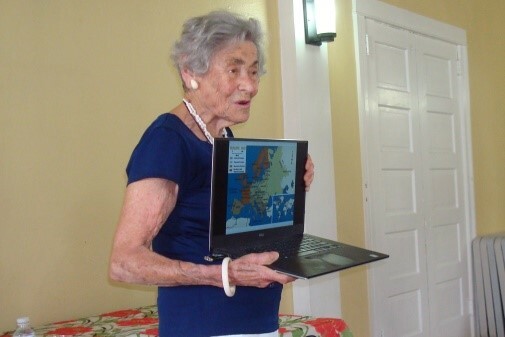 On June 25, Margit Meissner riveted her BMAV audience in recounting her early life and escape from Europe to the US in 1941. She was born in Innsbruck in 1922. When she was an infant, her family, wealthy, assimilated Jews, moved to Prague, where she led a privileged life. She described her early years as “white socks,” because appearances were so important; she mustn’t get her socks dirty. Education also was important. Margit went to school six days a week, had private lessons after school, learned English and French from nannies and had lessons in riding, skating, piano and more. That life ended when she was 16, right after Hitler annexed all of Czechoslovakia. Her mother, frightened of what might come, sent Margit to Paris to learn dressmaking, and, she thought, keep her out of harm’s way. Her mother followed her to France later but lived in Versailles until the French police told her she’d be deported as an “enemy alien.” Just before she was taken away, she told Margit that it now was her responsibility to get them both out of France. Margit did, through luck and taking risks. She was reunited with her mother, who had been in a French detention camp but got out during the confusion after France fell to Germany. They later got 30-day transit visas to Spain and Portugal. However, they couldn’t get French exit visas and were denied entry to Spain at the official border crossing. They sneaked into Spain at another point along the border, only to be caught and jailed by Spanish police. It was in prison, housed with other women that included prostitutes, where Margit had a “life-changing experience.” She and her mother had nothing. A prostitute gave them a bowl for food and some fabric Margit could use when she got her period. That kindness influenced Margit’s thinking and world view for the rest of her life. She and her mother arrived in the United States in 1941, where Margit became an active, informed citizen. She continues to advocate for human rights and against discrimination in any of its forms. July 2, Big Train baseball game, 4 pm. Free tickets in a reserved BMAV section are available for you, your family and friends. July 21, free outdoor movie. We'll carpool together to Bethesda Triangle (corner of Norfolk & Auburn Ave) to share drinks and popcorn in our reserved seats before a 9 p.m. showing of "Hidden Figures." For other events of interest coming up in July and August, visit BMAV’s online calendar often. Aging, dying and death. This group is in hiatus over the summer. The next meeting will be Sunday, September 17, 4-5:30 pm, at the home of Chris Palmer, 7210 Denton Road, Bethesda. For program information, contact Chris at 202-716-6160 or palmer@american.edu. Birding. David Moulton, moulton.davidh@gmail.com, leads early morning neighborhood bird walks about twice a month. Contact him for more information or to be added to the group’s list of walkers. Bridge. Contact Elizabeth Haile, director@bmavillage.org, for dates over the summer. Knitwits. Get together to knit together. All levels welcome. ContactHanne Caraher, hcaraher@verizon.net. Yoga. Meets Mondays, 10:30 to 11:30 for fee-based classes. Contact Elyse Jacob, elysejacob@gmail.com. Potluck group. Lynn Barclay has offered to host the first one, a sort-of happy hour, on Sunday, August 27, 5-7 pm. Each person who comes would bring wine, an appetizer or dessert. Contact Lynn at barclayda@earthlink.net if you’d like to participate in this first-time event. Other potluck gatherings could be dinner or lunch. Book club. Do you like fiction, non-fiction or poetry? If so, would you be interested in meeting to choose the first book and get to know each other? Hosts will be rotated and we'll find a day and time that works for all. Call or email the BMAV office if you’re interested or want more information. Foreign language conversation. The group would meet regularly in a social setting, where you’d have the opportunity to maintain or refresh your language skills and discuss current events of a country that speaks that language. Contact the BMAV office if you’re interested. By joining BMAV, it’s a given that you want to stay in your home rather than move to a retirement community or other facility. But as you age, so does your home and at some point it may become unsafe. For example, life may throw you a curve ball and you find you have difficulty going up and down stairs. A recent New York Times article, “Planning to age in place? Get a contractor now,”urges us to make changes to our homes soon, before they’re needed, so that if something happens to us, we’re prepared. If you’re a writer of any genre or love literature and the written word, you should know about The Writer’s Center in Bethesda (4808 Walsh Street, one block north of Trader Joe’s). The center offers a range of workshops, programs and a variety of events, including readings. Some events are free, some are not. The center received the 2017 Best of Bethesda editors’ pick for “Best place for literary inspiration” from Bethesda Magazine. Have a suggestion or question about BMAV or our community or an idea for an article? Contact newsletter editor Lynn Barclay at 301-320-4962 or barclaylg@earthlink.net.